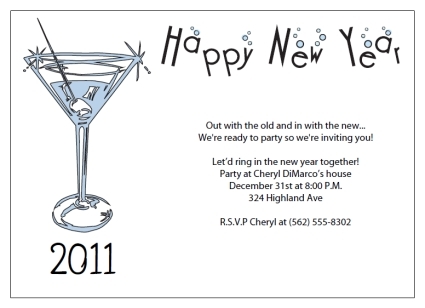 Wanna make your own New Years party invitations? I've created several free templates to create your very own handmade party invitations! Celebrate New Years Eve in style by inviting your guests with a touch of personality! 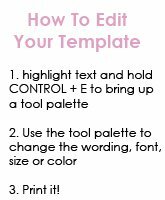 All of our printable templates can be printed with the use of Adobe Reader or a similar Pdf reader. If you do not have a PDF reader you can download Adobe reader for free by visiting Adobe.com. I've included several templates - the first being a very simple arts and crafts template. This template is for the hands on crafter. There are no bells and whistles! Simply print the template onto some plain paper. You can choose to fold the paper into quarters to create a simple quarter page invite from a single sheet of regular old standard weight paper. 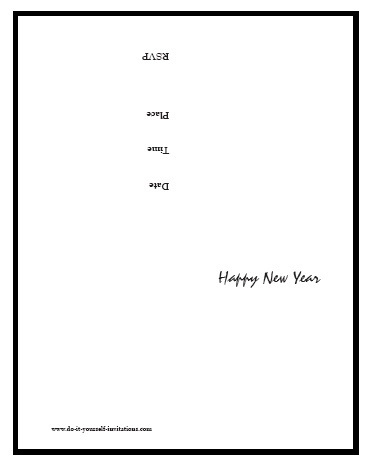 OR you can print it onto heavy weight cardstock, printing back to back AND upside down (opposite from each other) to create folded cards. To create the folded cards you must cut the paper in half after printing, and fold the cut pieces in half to create two folded new years party invitations from one single sheet of cardstock. After printing and creating your invitations you can then personalize them by adding your own drawings, stickers, ribbon, glitter and glue, or any other embellishment or decoration you may choose. This template is also a great childrens craft for the holiday! This template comes two ways, one is to create a folded card, and the other is for a flat 5 x 7 flat card invitation. 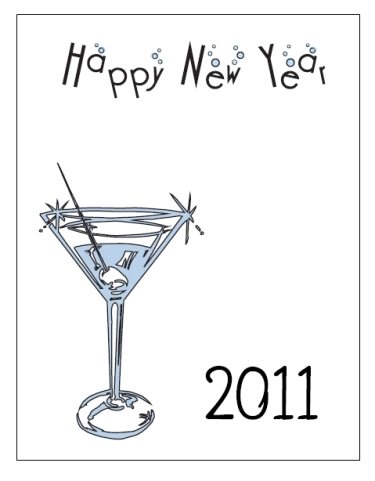 To create New Years party invitations with the folded card template, simply print the template onto some heavy weight cardstock. Cut the paper in half and fold each piece in half. You can choose to hand write the party details into the inside of the card, OR you could use our custom text printable invitation templates to help print your text into the inside of the card. To do so you will have to flip the printed template over in your computer printer and print onto the opposite side. Make sure and print only one at first. If you mishap on the paper orientation then you will only scrap one "oops" copy.